Slovakia is littered with castles, some in ruins, others in remarkably nice, well-preserved condition. We took the bus to Devin castle today, which is about 25 minutes west up the Danube from Bratislava's historical center. It's perched dramatically atop a jagged, rocky outcropping right at the confluence of the Morava and the Danube rivers, along the border with Austria. There were settlements on this spot as far back as the Stone Age, some of the ruins you see today date back to the Moravian empire (700s - 1000s, roughly), and there's even the foundation of something built much earlier by the Romans. Sadly, Napoleon blew the thing up in 1809, which is the reason for its current ruinous state. The little crenellated tower that caps the arm-like outcropping that juts skyward is known as the Maiden Tower, and there are some colorful myths attached to it. The views from the castle itself (of Austria, the Danube, the Morava, the village of Devin, etc.) are worth the climb, and there is a path that snakes its way up the hill to the castle ruins. Visually, the castle and its atmospheric setting are quite nice. At the base of the castle is a monument to those who died trying to escape across the border to Austria during communism. An estimated 300 people were shot dead while attempting to flee. 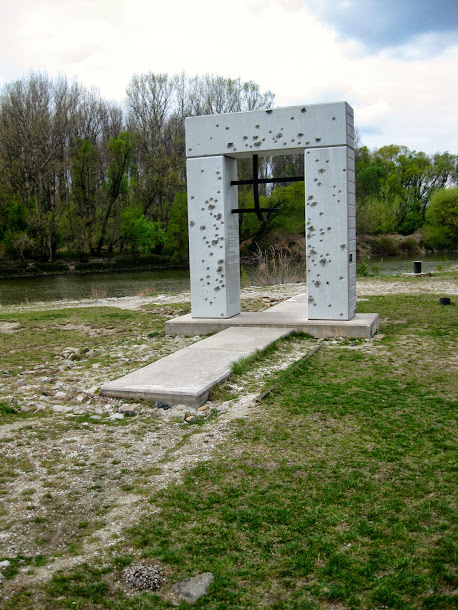 The monument is pockmarked with bullet holes to symbolize the tragic fate that befell these people. It's especially sobering to contemplate how this whole area along the border was a heavily guarded militarized zone during communism, which may be easy forget given how scenic and tranquil it is today.